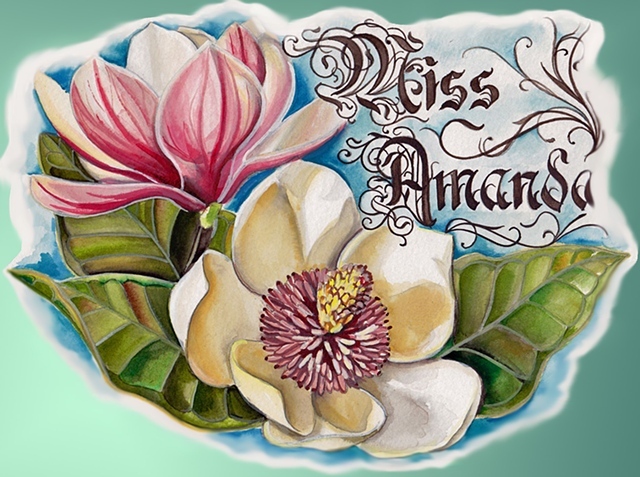 Hello and thank you for checking out Tattoos by Miss Amanda! Miss Amanda is a tattoo artist that strives to make each tattoo a living work of art. Customizing each tattoo for the individual, a unique piece of art designed with the wearer in mind. Being an artist her entire life, she has an extensive background in multiple mediums. This gives her a wide range of inspiration that she extends into each of her tattoos. Miss Amanda was born and raised on the east coast in southern Maryland. With a love and talent for art from early on, and after studying art in college, it seemed only natural to pursue a career creating permanent works of art on the skin! She began working in and around tattoo shops in 2001 and after constant vigilance finally began her tattoo career in 2005. After tattooing in two shops on the east coast, her and her husband decided to head west and settle in beautiful Salt Lake City. Now tattooing at Twenty Seven in Salt Lake City with one of the greatest collections of awe inspiring tattoo artists ever! Continuing to grow and learn as an artist, pushing the envelope with each new tattoo and loving every minuet of it! Art is fun!